Elliot and Becca Thompson took over The Star and Garter in Falmouth in summer 2015, and I’ve been watching its reputation and popularity rise, recently winning the award for Best Foodie Pub in the Food Reader Awards. The kitchen is run by a trio of talented chefs – Steve Knowles, Andi Richardson and Adam Banks – who met whilst working at Fifteen Cornwall. 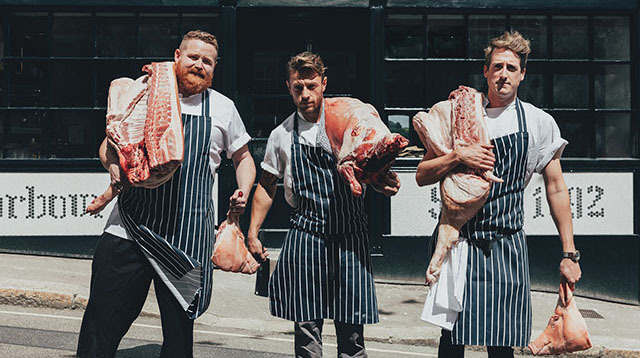 They are passionate about local produce and nose-to-tail eating, happy to butcher whole animals and smoke as much as possible on their beloved Big Green Egg. 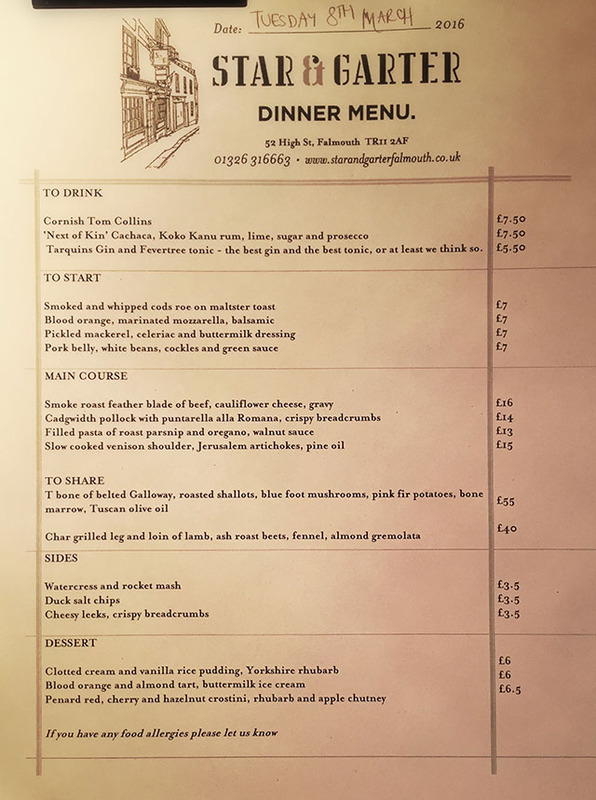 Every time I see their pub menu on social media I vow to visit, so we took a trip to Falmouth a couple of weeks ago to try out a midweek supper. 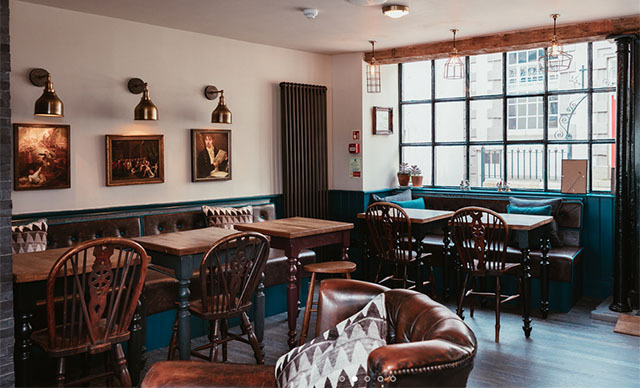 The pub is beautifully decorated with a cosy welcoming bar and larger dining area overlooking the harbour. I loved the open kitchen downstairs which smelt of holidays (i.e. barbecues), and the loos deserve a special mention just for being so lovely. 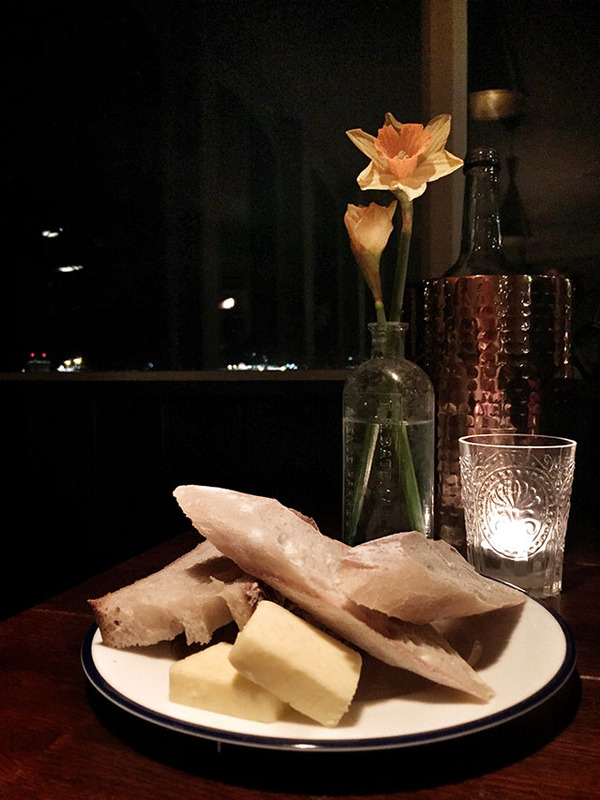 We sat at the window with a view of the lights across the harbour, and tucked into some good crusty bread from Stones Bakery with slabs of really salty butter. I chose the smoked and whipped cods’ roe (£7), which was silky smooth, cold and smoky. 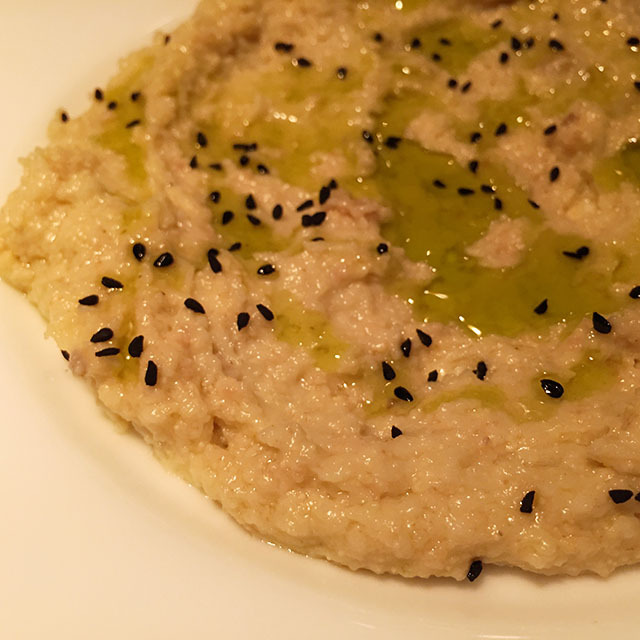 Drizzled with extra virgin olive oil and sprinkled with black sesame seeds, this was like a subtly fishy hummus, in a good and very garlicky way. The roe was accompanied by slices of charred maltster toast. Jim opted for pork belly (£7) with white beans, cockles, a herby salsa verde which cut through the richness and fattiness of the meat, and a good hit of garlic. The pork was tender, the crackling chewy yet crunchy, and the dish worked really well. It was a generous portion which could have passed as a main course. For our main course, neither of us could see past the smoked roast feather blade of beef (£16), especially having drooled over a picture of it on Instagram earlier in the day. 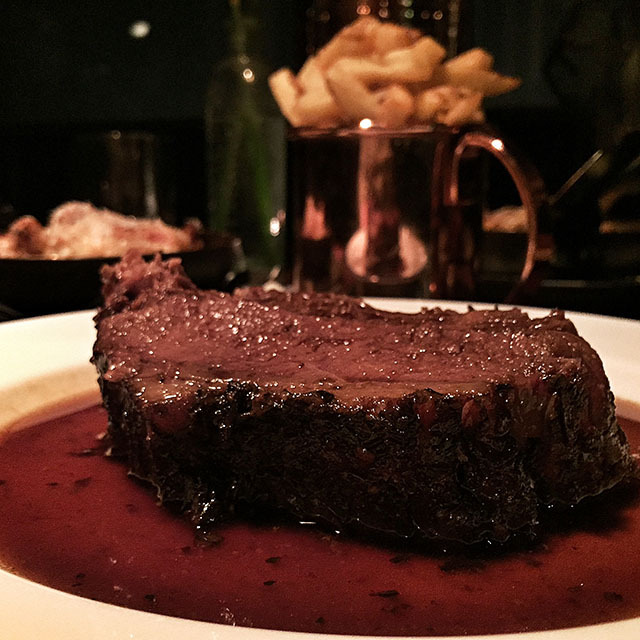 The big slabs of smoky, tender, fall-apart beef were served with a rich, red wine gravy. On the side we each had our own pan of cauliflower cheese, and not just ordinary cauliflower cheese. The cauliflower was soft and strangely brown having being braised in stock before being topped with white sauce and Parmesan. I particularly liked the addition or rosemary to the dish, something I’ll be copying in the future. We also ordered some duck salt chips (other sides available were a watercress and rocket mash, and cheesy leeks with crispy breadcrumbs, £3.50 each), which sounded too good to miss. They were indeed salty, and they passed the chip test*. Our mains were huge, hearty portions and we couldn’t finish them. 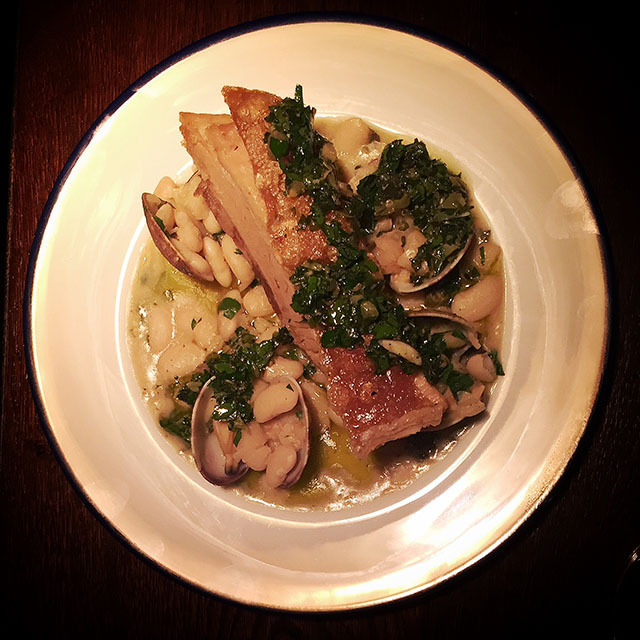 I really enjoyed the flavours (be warned – there is a lot of smokiness and the style could be described as “blokey”) but was slightly daunted by the size of the meals and would have liked to have seen some green veg on the menu for a better balance. 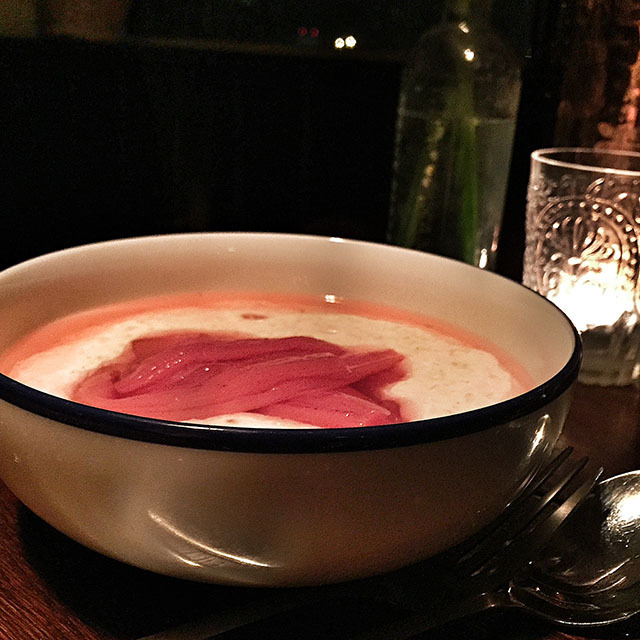 I find it difficult to resist pudding, even when full; we decided to share a clotted cream and vanilla rice pudding with Yorkshire rhubarb (£6). It was creamy and delicious, not overly sweet, and the poached pink rhubarb had a sharpness to balance the dish. The rice was still slightly al dente, giving extra texture to the pudding. My only issue was that there was enough to feed a family of four and it felt so wasteful not being able to finish it. 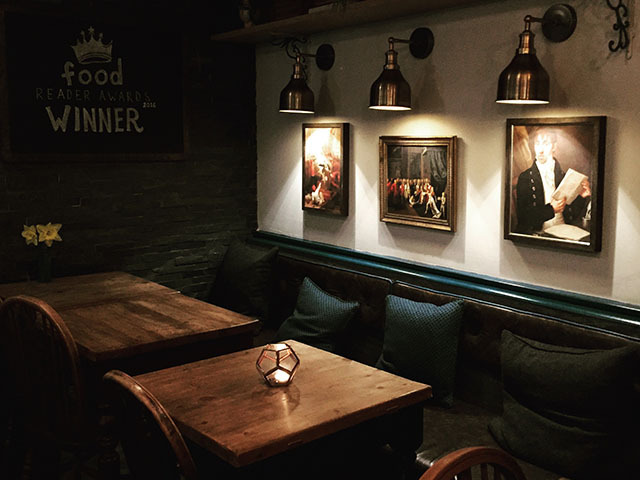 You could really feel the passion behind the cooking in this pub, and the dishes are strong, bold and confident. The chefs have quite rightly gained a reputation for serving big, flavoursome food, and the pub is well worth a visit. *The Chip Test: I think that a perfect chip is equally good cold as hot, which means that you can eat them all. Thank you to Elliot, Becca and their team at The Star and Garter for treating me to supper and for looking after us so well. We’ll be back again soon to enjoy that fabulous view in daylight. Header image and top two images by Kirstin Prisk. Others by me.